If it is at all unclear how much I adore the restaurant Animal, let me reiterate it here: Animal is my favorite restaurant in Los Angeles. When I can’t make it up there for dinner, riffing on their poutine dish at home is a pretty decent substitute. When we do eat at Animal, we go for the indulgence factor. As much liver as possible please, which means starting with an order of chicken liver toast followed by at least one, if not two, foie gras dishes. I realize this doesn’t exactly paint a picture of health, but I don’t think a restaurant with the name Animal is going after the health-conscious diner. Though some Angelenos seem slow on the uptake in this area. On a recent visit, we caught a neighboring table pleading with one of the waiters that they must have something, anything vegetarian?? I’m not sure what, exactly, was misleading about a restaurant named Animal, but this diner seemed thoroughly shocked at the lack of meatless options. I wanted to cheer the waiter on when he politely declined to make any substitutions. You just can’t make this stuff up. As much as I love dining at Animal, I have often wished that I could expand my Animal-at-home repertoire, so I was thrilled to see them (Chefs Jon and Vinny), and some of their recipes, featured in Food & Wine's January issue. Liver aficionado that I am, chicken-liver toasts with shallot jam was the obvious choice from the three or four recipes offered up in Food & Wine. Oh, and if you know any non-liver loving friends? Try this recipe out on them, I think I may have finally converted a NLL friend of my own. Melt 2 T of butter in a large sauté pan over high heat. Season the chicken livers with salt and pepper and cook until lightly browned, about two minutes per side. Remove the livers to a plate. Melt 2 T of butter in the same pan over medium heat. Add the onion and thyme and cook until the onion is soft, about 10 minutes. Add the chicken livers to the pan and cook for an additional two minutes. Set mixture aside to cool. Once the livers have reached room temperature, discard the thyme and puree the mixture along with the remaining 6 T of butter in a food processor until smooth. Jon and Vinny strain the puree through a fine mesh sieve, but I skip this step for a slightly more rustic product. Your choice. Either way, season the puree well with salt, cover with plastic wrap directly on the surface and chill until set. Make the shallot Jam while the liver is chilling. Heat the vegetable oil in a medium skillet and add the shallots. Cook until softened, about 10 minutes. Add the balsamic and brown sugar and simmer until reduced to a thick jam. Jon and Vinny seem to think this should only take about five minutes, but it takes me 15 to 20 minutes. Either way, cook it until thick and season with salt. Once the liver is set, preheat an oven to 400*. Cut the baguette into thin slices and toast in the oven for 10 to 15 minutes until crisp. Immediately brush the toasts with olive oil and rub with garlic cloves. 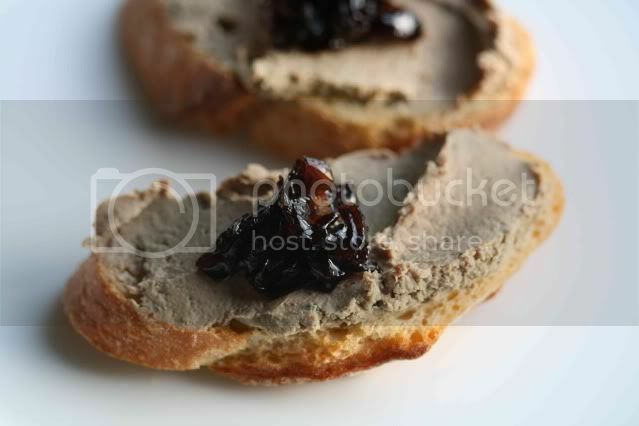 Spread a healthy helping of liver mousse on top of the toasts and top with some of the shallot jam. This looks incredible! 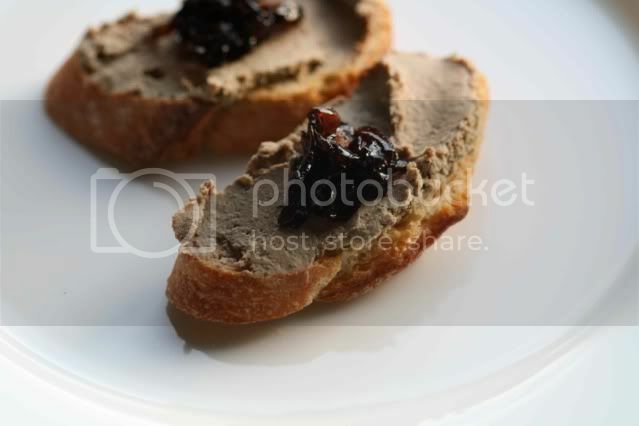 I'm just imagining myself spooning a big dollop of pate onto my teeny piece of toast. Wow... that vegetarian takes the cake. I love that story... and this liver looks incredible. I'm with you: if you're going to go to a place called Animal, go all out. This looks incredible. I will make sure to put Animal on my radar as I am visiting LA for the first time this summer. Most chicken liver dishes I've seen use cream, not butter, but that only makes this one more interesting. And buttery. And delicious. Thank you for sharing. I might cheat though, and put some fresh goat cheese and a little time on top of the toasts if I didn't have time to make the shallot jam. Yum! I am a liver-lover. Anthony Bourdain has a great recipe in his Les Halles cookbook for chicken liver vinaigrette. It's fantastic! I want it, want it WANT IT!!! Yum. Sounds so good. I really want to try this restaurant on my next trip to LA. Yummy! Thanks for such delicious recipe. It can be use as a breakfast recipe. I was just reading about this recipe on the plane, returning from LA. I wish I had read about it and about Animal on my way to LA!